This post was written by peterjmurray on February 26th, 2015 6:09 pm Comments Off on UP IN ‘LUVLY’ LEEDS! So sorry for the delay in this blog entry…we’ve been working so hard and visiting so many schools it’s sometimes difficult to keep up! And three lovely schools that deserve a mention are Farsley Farfield, Horseforth Newlaithes and Bingley Grammar School. All three schools provided a fantastic welcome and were a real pleasure to visit. Farsley Farfield was one of the first schools I ever visited as an author and I will never forget the tapestry the school created depicting the entire Mokee Joe story from Book 1. Mr Cooke, the deputy Head of the school, remains a loyal supporter of our work over the years and it was a real treat to link up with him again. 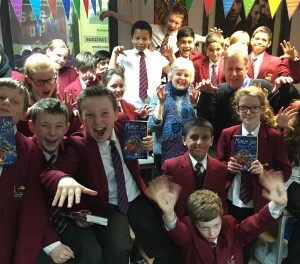 His lovely wife now works at nearby Horseforth Newlaithes Primary School, and being only three miles from Farsley Farfield, it was a simple journey over to her school to enthuse a new KS2 audience of excited and enthusiastic pupils. Kath and I loved our visits to both schools and can’t thank them enough for organising our visits so efficiently. We look forward to continuing our relationship with them and will be back soon….you can bet on that!! Bingley Grammar School was also close by, BUT….what a nightmare journey by car along congested roads etc. By the time we got there we were already tired out! However, the tedious journey was worth the effort! Jenny Barnes proved the perfect hostess and introduced us to one of the best Year 7 groups we’ve ever worked with! Half-term followed and Jenny headed off to Kenya armed with some of my most scary books! She has since e-mailed to say the trip was a life-changing experience. What she didn’t say was whether or not that was down to Kenya or my books!! Again, can’t wait to get back to yet another great school. A MASSIVE ‘thank you’ to all three schools for giving us such a lovely way to finish off the first half-term. Kath and I have always loved the Pangbourne area, location of the famous children’s novel, Wind in the Willows. When I was a teacher a Cheam School, I used to fish the weir pool at Panbourne, courtesy of a lovely lady, Mrs Ellie Soar, who I’ve recently heard has just passed on. Mrs Soar often brought me a glass of wine to cheer me up when the fish weren’t biting…and even when they were! I remember once playing a fish with one hand and holding a glass of wine in the other. Happy days! The tea rooms in and around Panbourne are also well worth a visit so when Long Lane Primary in Tilehurst and Langtree School in Woodcote asked us to visit, both close to Panbourne, we were more than happy to oblige. Long Lane Primary proved a great school. 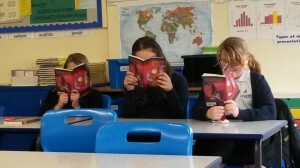 We performed our spooky Mokee Joe presentation and soon had everyone buzzing about our books. The signing the next day was VERY popular. 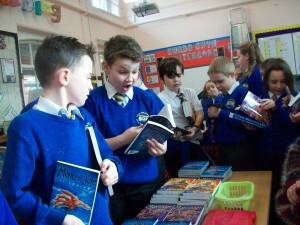 Hope you like the pics….who says children don’t get excited about books anymore?? spooky stories contained in Ten O’ Clock Caller. This great school proved to be one of our most favourite senior schools ever and even the Headteacher was more than enthusiastic to get involved, inviting us later to chat to a group of Year 11’s and being at the front of the queue the next day to obtain a signed copy of the book. Thank you to all at these two extremely pleasant schools for making us so welcome. We intend to be back in the not-too-distant future.